Don’t tell my kids this, but when I was a senior in high school, my best friend and I skipped school one afternoon. We went to her house because both of her parents worked, so nobody was at home. We ate some snacks, and watched a movie. I remember a lot of things from that experience, but one of the most memorable is the way my dad handled it. I’m sure he was disappointed that I’d made a poor choice, but there was no shaming or hefty punishment. We talked about it, and he just seemed to believe that I wouldn’t make that same choice again. He was right. Would he have been justified in taking away my access to the car or denying me some of my other freedoms? Of course. But in my eyes, he gave me grace. Denny Kenaston, in the book The Pursuit of Godly Seed, takes a chapter to contrast the Old Testament covenant of the law with New Testament grace, and relates them to parenting. Listed below are just a few of the points he makes as he explains the differences between parenting by law and parenting by grace. We can be our children’s chief encouragers! Constantly critiquing them causes them to lose confidence, and can keep them from wanting to try new things. And while we definitely have to correct them at times, we can do it in a way that isn’t a personal attack. I’ve learned that timing is another important key to correction. It’s like the old saying, “Don’t kick him when he’s down.” If he’s had a rough day, it’s okay to wait a little while before addressing a problem. If, like me, you have a bent toward perfectionism, this can be an easy trap to fall into. Your child can feel like they have a hard time meeting the “perfect” standard you’ve set for her. We certainly want our children to do their best, but they are, after all, kids. This reminds me of another saying, “Praise progress, not perfection.” Find ways that they’re improving or just notice that they’re really trying to do better, and cheer them on. Assume the best. Look for the good in your child. I think of how awful it would be for me to live under a spirit of criticism, and I certainly don’t want that for my daughters. Try not to bring up the past in a bad way. “You never obey me. This is exactly what happened last week, and you still haven’t learned your lesson.” If you’ve dealt with the previous experience, move on, and don’t refer back to it. After all, do I want my children to remember the times I’ve spectacularly failed as a mom? Do I want them to remind me of the time when I raised my voice or totally lost my patience? No. So let me give them the same consideration. Our love for our children shouldn’t be based on how they’re acting today. It’s not, “I love you (because you’re being good/obeying me/making me look like a good mom).” I want our girls to know that they are loved no matter what. That means I’m taking the time to listen to them and take an interest in what they’re doing. As long as we have a relationship with our children, we can still have influence in their lives, even as they go through the teenage years and beyond. 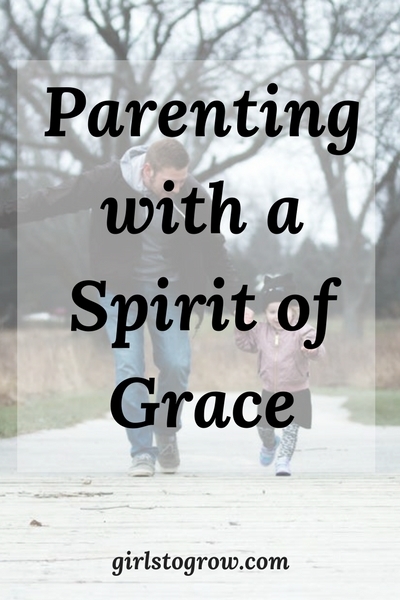 So how can we, practically speaking, parent in grace today? 2. Don’t re-do any task they’ve already completed. Just leave it like it is, and thank her for doing it. 3. Assume your child had a good day at school, and don’t ask if he got into trouble. 4. If you need to discipline your child, don’t bring up any past bad behavior in the process. 5. Find one way to show your child how important she is to you. It could be as simple as an extended hug, reading an extra story at bedtime, baking together, or putting a note or special treat in their lunch box. Rules and discipline are a necessary part of life. But let’s show our children that there’s also love, encouragement, and forgiveness for them in our homes. Just as Jesus has extended his “grace beyond measure” to me, a sinner, so may I live out that grace in all of my relationships. 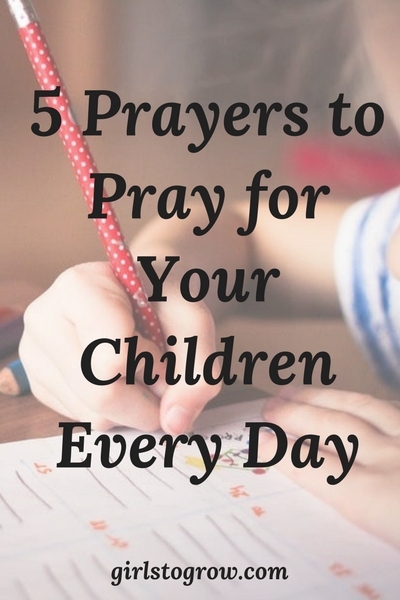 Praying for our children is something we can do every day of their lives. There’s not much else that can claim that significance! And while I’ve always been mindful of the need to pray for our girls, I would definitely say my prayers have changed since they were little. When they were younger, I felt like I had more control (though in reality, we know I didn’t!} The older they get, the more I see my need to trust God with their lives. I’m not there 24/7 to help shelter or guide them. But He is. I’ve talked about my monthly prayer list, and how I tailor that to specific needs in our family. I’m still using that format. But today I wanted to share a few general areas that are important to cover in prayer as well. 1. Pray for their physical safety. When my girls were younger, my concerns had more to do with them falling off a piece of playground equipment or being taken by a stranger. Now it’s more along the lines of asking God to protect them during their drive to school, and for them not to get seriously injured during a basketball game. Whatever the physical threat to our children is, we know that God can keep them safe. 2. Pray for protection from evil and wrong influences. Children lose their innocence at such young ages today! Because of our current culture, we’ve felt it necessary to discuss certain topics with our girls at earlier ages than I would have liked. And no matter how you educate your children, there’s always an opportunity for them to see or hear something that can influence their thoughts the wrong way. Our girls attend a Christian school, but I’m not naive enough to think that they don’t encounter serious temptation there. 3. Pray for spiritual growth. Regardless of what sin it is, we can pray for God to convict their hearts. We want them to be sensitive to the Holy Spirit’s leading, and to quickly ask forgiveness when they realize they’ve done wrong. 4. Pray that they’ll make good decisions and wise choices. If our daughters will hide God’s Word in their hearts, and apply it to their daily lives, they will be blessed in many ways. We know that living out those Bible truths will spare them from the heartache that sin brings. 5. Pray for their relationships. This includes friendships, teachers, coaches, and certainly siblings. I think it makes all our mama hearts happy when our kids are getting along with one another! Our children’s friends play an important role in their lives, as do other adults. I’ve written before about wanting good role models for our children. We can pray that God will give them friends who will encourage them in their walk with God, and adults who will live out a Christ-like example. Yes, prayer takes time. But I don’t think there’s any better way to spend our time than asking for God’s blessing and watch care over our precious children. I haven’t written much about parenting lately. I think it’s because the teen years are a whole different ballgame. It’s easy to overshare and include stories my daughters may not want out in the public arena. I need to respect their privacy. And if any phase has revealed how inadequate I am as a parent, it has to be these teen years! There are many wonderful parts of having teenagers – really, there are!! But, especially as they move further into the teen years, there’s an ongoing struggle between giving them independence while still monitoring what’s happening in their lives. Letting go is a process that takes time and work as you shift your relationship with your child from one of authority to one of influence. Recently I was looking back over some of the goals I had written out for our girls when they were younger. I like having goals as a mom because they make me evaluate what I really want to aim for as I parent. They also give me a greater purpose as I look toward the future when it’s so easy to get bogged down in the day-to-day routine. I realized that these goals are still applicable, so I’m sharing them here today. I’m certainly not doing this parenting thing perfectly, but it was good to review the long-term vision for the impact we can have in their lives. 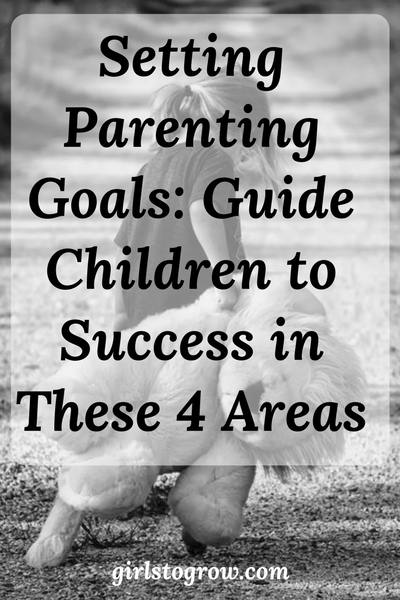 Maybe this list will encourage you to develop some of your own goals as you raise your children. The spiritual “first step” is having our children make the decision to accept Jesus Christ as their Savior. Praise the Lord, as best I can tell, both of our girls have done this. However, should they ever have doubts, I want to take those seriously and make sure they have assurance in their own hearts that they are saved. 2. Live in God’s will for their lives. I hope I’m always open to letting God lead our girls where ever He wills. My part is to encourage them to pursue their interests and follow the path God has for their lives. May I never allow the plans that I think would be good for them to supersede what God may be doing in their lives. 3. Actively serve God and others. Whatever their life’s calling, I hope that our daughters serve God in their local church. The very best use of their God-given talents would be using them to encourage other believers and reach out to the unsaved. I hesitate to use the word self-esteem, but the idea here is that they are confident in their abilities and believe that, with God’s help, they can accomplish whatever task is set before them. I believe they can maintain a spirit of humility while still reaching for their dreams. This one is certainly a life-long struggle, but being able to control your emotions is an important part of maturing in Christ. My goal here would be for them to experience Christ’s joy throughout their lives, regardless of circumstances. 1. Have our girls always be reading and learning new things. I want to do this right alongside them – be a lifelong learner! Whether it’s by reading a book, watching a video or taking a class, there’s always a new skill to be learned. We’ve trained our girls to divide their allowance (and any other money they receive) into the categories of giving, saving, and spending. Our older daughter now has a budget and knows how to balance her checkbook. We want them to learn how to handle money wisely while they’re still under our roof. 3, Develop an appreciation for good music and quality entertainment. We’ve always enjoyed take our girls to plays and concerts. Exposing them to fine arts and quality productions will hopefully enrich their lives and cause them to choose good entertainment as they get older. 1. Teach my daughters how to properly care for their bodies.. This would include knowing how to eat healthily, and get enough exercise and sufficient sleep. 2. Know how to run a household, including cooking, cleaning and basic maintenance. They’re learning to wash and iron their own clothes, fix meals, and clean up after themselves. We also want to train them to make wise purchases, whether it’s selecting furniture or buying a new car. 3. Help them to develop their physical abilities. Here are some practical ways I’ve tried to work toward these goals with our children over the years. Talk frequently about salvation. 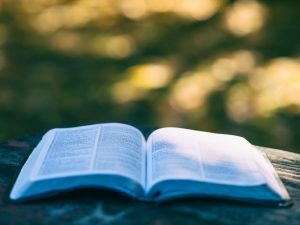 Read biographies and other devotional stories that involve someone coming to Christ, and that explain the plan of salvation. Create an environment that makes it comfortable to talk about spiritual things. Discuss what they’re learning in Sunday School, children’s church, youth group, or in the other services at church. Expose them to preaching that gives the gospel and encourages them to follow God’s Word. Have them help me when I serve others. They can work with me in the nursery or children’s church, play an offertory on the piano, and help make a meal for someone who’s sick. Help them find activities in which they can excel, and provide opportunities for them to flourish. Be an enthusiastic supporter and cheerleader at their games, concerts, etc. When one of the girls comes to me with a problem, remembering to pray about it with them as a first resort, not a last. Some months ago, one daughter was talking to me about a difficulty she was having with a friend. We were riding along in the car and I was waxing eloquent about the best way to deal with the issue, when my other daughter piped up, “Why don’t you just pray about it?” I was convicted!! That should have been my first response as well! Create an attitude of gratitude in our home. It’s easier to live in joy when we notice all that we have and purposefully give thanks for it. 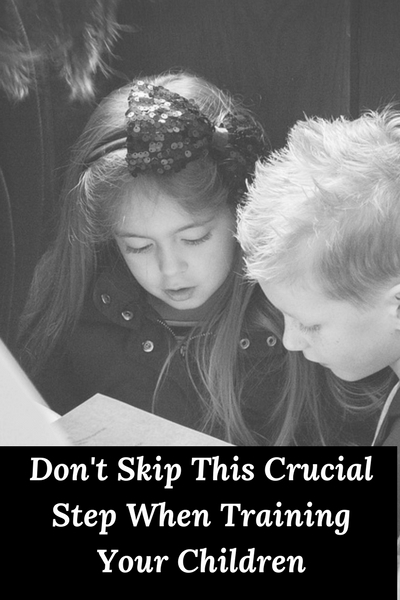 Invest time and money into character-building books, activities, and entertainment. You may choose different goals than these, but I do think it’s helpful to see exactly where we want to go with our parenting. We’ve been given such a great responsibility to steward these gifts from God. I’d love to hear any ideas you have as you set some goals for your parenting! One of my favorite Bible verses about parenting comes from an unlikely place – the Christmas story. As many times as I’ve read it, Luke 2:19 always brings Mary to life as a mom just like me. What great and wonderful things Mary had to ponder! Her baby was Jesus, the Son of God Himself. His birth had been announced by an angel. She’d carried a baby in her womb without ever having a relationship with a man. In the midst of a trip to another town, while staying in a stable, she’d given birth. Furthermore, shepherds appeared in the doorway to worship her son. How full her heart and mind must have been with all that had taken place! 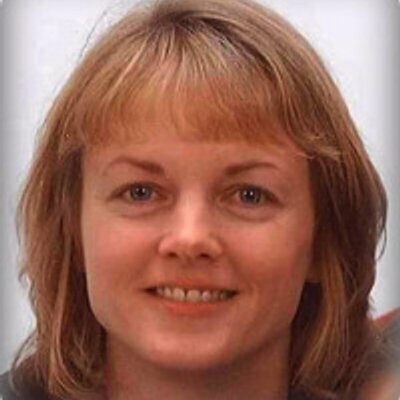 Mary kept these events fresh in her mind, she reviewed them over and over. Surely she thought long and heard about what all of this meant in regards to her child. Admittedly, Mary witnessed miraculous events surrounding the birth of Jesus. We moms surely won’t share those experiences, yet we do have much to think about when it comes to our children. What type of thoughts do you meditate on when it comes to your children? If you’re like me, you spend a lot of time thinking about them. Whether it’s how they’re doing in a particular subject in school, the way they’re responding to correction, or their latest friendship, I’m usually reflecting about what’s going on in their lives. Recently I was talking (okay, obsessing) to my husband about something related to one of our girls. I’d had a bit of a run-in with her that morning, and I was focusing on a negative behavior. And honestly, in that moment, I’m sure my mama mind was blowing it out of proportion. Being the voice of calm (as always), he gently encouraged me to think of all the positive things about her – and admittedly, there are many. As he listed a few of them aloud to me, I realized he was right. It was a reminder to me that I can let one negative incident color my perception of my child for days. 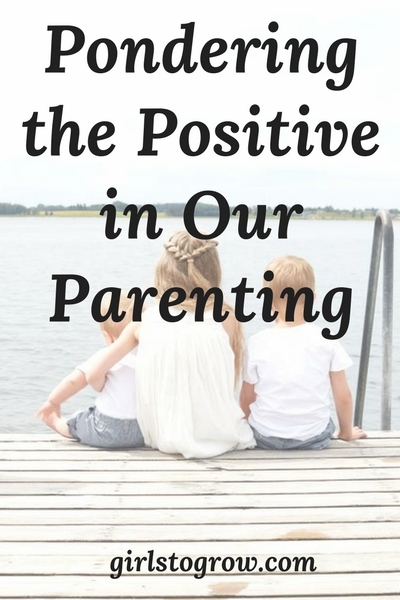 What I realized anew is the importance of focusing on the good in my children. If I look for the bad, I’m going to find it. And honestly, it’s often easier to see all that needs to be corrected, and the many ways they could do better. If, instead, I focus on the good, I find it easier to encourage her. I can speak words that bless her and lift her up. Because if the good is what I’m looking for, that’s what I’m more likely to see. Yes, there are issues that will need to be addressed. But with both of my girls, I want to make sure I notice and think about the good. After all, I sure like to be told what I’m doing right more than I like to hear about what I’m doing wrong! Ultimately I want to concentrate on those things that have eternal value. My highest calling as their mom is to see them come to know and love their Savior. My daughters’ spiritual condition, seeing them develop a personal relationship with Christ, is my top priority. If her room is messy when she leaves for school, but I know that she took a few minutes to pray and read God’s Word, that’s a win. If I see her being kind to a classmate who needs help, I’ll put less importance on the inconvenience of making a trip back to school to retrieve the book bag she left in her locker. Our children are blessings from God, beautiful treasures that my husband and I have been given to raise. I want to take each day, each stage, each age, and see the good in it, enjoy it to its fullest. Yes, some seasons will be easier than others. But we will not pass this way again, these lovely young ladies or I.
I believe Mary looked back often on those early days with her baby boy. How special those memories must have been! May I, too, soak up the moments today, focusing on all that is good in my children, so that one day I’ll have many good memories to ponder. Another school year is winding down. My daughters’ last day is Friday, then we’ll enter the summertime zone. 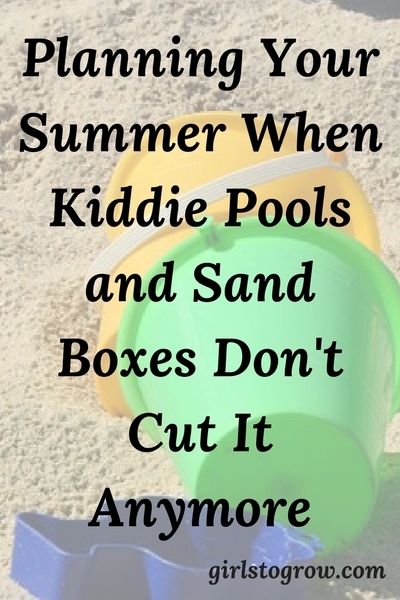 Summer used to mean a kiddie pool in the back yard, bottles of bubbles to blow, and a sand box to dig in. It meant trips to the park to swing and slide, and Popsicle juice running down your arm. Now summer looks like my 16-year-old getting her first real job – one she can actually drive to all by herself. It means a week away at camp. It’s starting to plan college visits and looking ahead to ACT testing. Needless to say, we’ve moved into the realm of serious, grown-up-like stuff. The summers of then and the summers of now are both fun in totally different ways. Yes, there are some sweet memories associated with the bubbles and sidewalk chalk and kids running through the sprinkler. And these days, I appreciate how my girls can entertain themselves quietly with a book or another project for hours on end. Back then, it was me pushing the swing and blowing the bubbles in the 90+ degree heat and humidity, wishing I could be inside in the air conditioning. Now I get to sit in the air conditioning while I’m praying that she makes it safely to work or looking around an empty bedroom and missing her while she’s at camp. Every summer has a different rhythm. Some have been loud and busy and long. Others passed quietly and all too quickly. The older I get, the more of a blur they are. Yet there’s still the pull of that slightly slower schedule. There’s time to savor sitting side-by-side on the couch reading books, staying up late watching a movie, and sleeping in until the sun’s already been up for awhile. I previously mentioned Katy’s post The Schedule that Saved Our Summer. Now I’ve decided to put her ideas into practice with my 14-year-old. (My 16-year-old may participate in some of this, depending on her work schedule.) I took the days of the week Katy designated (making a minor switch for Friday), and listed at least five ideas under each category that will work for us. We’ll likely add a couple more as the summer goes along. Between vacation and camps, we have less than ten weeks of summer. Therefore, we won’t quite make it through each round of ideas twice. In case you’re like my daughter, and a little stressed that too much planning equals too little down time, don’t worry. I’ll make sure to build in days with no expectations and just pure summer relaxation! For further reading on how I’ve planned out our previous summers, visit these posts. Are your children done with school yet? Have any plans for the summer? 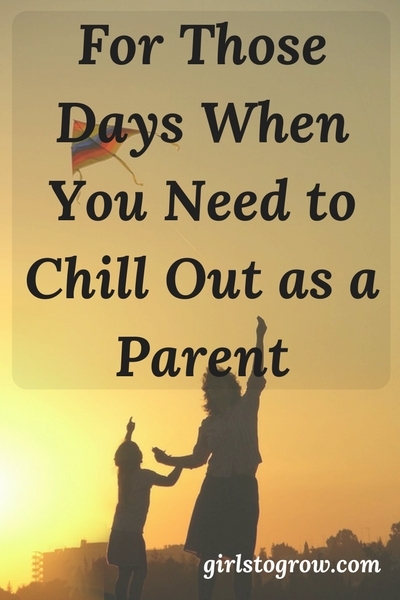 Sometimes I feel that my approach to parenting is simply to move from one small crisis to the next, getting worked up over whatever needs to be taken care of in the moment. Or, if there’s actually nothing I need to be addressing in the present, I’m probably worrying about what the next issue will be! I think it’s the worst with the oldest child. As my parents would say, she’s the “learner child.” Working through problems with her is typically a brand new process for me. With just two children, I guess my youngest is the only one who will benefit from my (hopefully!) learning from my mistakes. Essentially, I find that I sometimes make EVERYTHING a big deal. I’m writing these words today to remind myself to take deep breath, followed by a step back, and remember this advice. Only make things that really are a BIG DEAL a big deal. Let the little stuff go. Not every battle is worth fighting, especially if winning is going to drive a long-lasting wedge into the relationship I have with my child. Let the BIG DEAL stuff be my big deal, not someone else’s. To me, eating to a certain level of healthiness and getting enough sleep most nights are a big deal. Yes, we have PopTarts® in the pantry and chocolate yogurt in the fridge. But the girls get fruit in their lunch box every day. Several times a week, I try to serve a vegetable they at least tolerate enough to eat. And as for getting enough sleep, that’s to benefit me as much as them, ’cause nobody likes to deal with a sleep-deprived, emotional teenage girl! Someone else’s big deal stuff may be totally different than mine, and that’s okay! 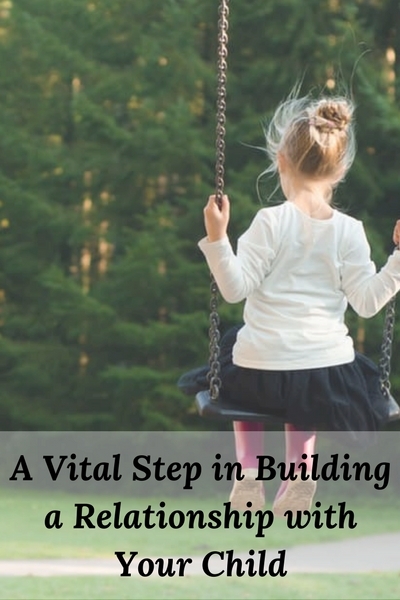 Hitting milestones ahead of time is fine…but so is letting my child develop at her own pace. Everything doesn’t have to be a race to be first. I can encourage my child to excel whenever she can. But if her ability in a certain area is average, that’s okay. If she can improve by working hard, great. But if average is her best in that area, I can deal with that. Focus on what’s really going to matter when my kids are 30. That’s their walk with God, their character, their generosity, and their relationships with others. If I want to be hyped up about something, I should focus on what I can do to grow my children in those areas. If I’d mastered all this as a mom, I wouldn’t be writing about it!! I’m sure today will be a challenge in one of these areas, so I’d better print this out and hang it on my refrigerator! If you haven’t done this yet, check out the Ultimate Homemaking Bundle sale for a great list of homemaking resources at a super price! Two weeks ago, I drove my teenage daughters to their school at 5:30 in the morning. They wanted to ride a bus with their friends to the state fine arts competition. I raced back home, ate a quick breakfast, then started my own hour-and-a-half drive to the competition. The odometer clicked along as I drove down the interstate…putting just a few more miles on the car. That car takes us to basketball games, school concerts, piano recitals, and school plays. The miles are racking up, evidenced by my feeling like I have that vehicle at the dealership for regular maintenance every few weeks. Where will it take us next? I think college visits are lurking in our future. But I wouldn’t miss these miles for anything because it means we are there for our daughters. I don’t want them to just tell me about that free throw shot they made; I want to see it, and celebrate with them. It’s not enough to just hear how they missed some key notes in that piano duet; I want to be there to commiserate, then encourage them to move on to the next event. And it takes putting a few more miles on the car to be present for those moments. Am I going to have a meltdown if I have to miss a game? No. Things happen. But I want our daughters to know that in our world, being there for them is important. You may not be in the season of putting those miles on the car. For you, it may be celebrating that new puzzle he finally put together by himself or hanging that picture she colored on the refrigerator. Perhaps you’re cheering from the sidelines of a local soccer game where all the five-year-olds cluster around the ball. Maybe you sit in the stands at a Tee Ball game where the kids in the outfield are aimlessly picking flowers. But whatever your child is doing these days, be present in it with them. Look up when she calls you to see how high she’s going in the swing. Really notice when he connects the train tracks in a new way. Because we’re building relationships. We want our kids to know that we’re going to be there every step of the way, win or lose, succeed or fail. Is it always easy or convenient? No. I’m finding it is easier in these days to make time for all those things since the physical demands of parenting are less. But when you have younger ones to take care of or housekeeping chores that keep piling up, it may not seem worth the time to stop what you’re doing and focus on what they’re doing. Yet how much does it mean to our children to gain our approval, to know they have our full attention? Or, in this stage of mine, to know that they can look up in the stands and see me there, or if they’re up on the stage, that they can spot me in the crowd. I’m nearing the tail end of this active parenting stage. Is there one kindergarten field trip I regret attending? No. Is there one piano recital I wish I would have skipped? Not hardly. I know you moms that read here. You’re the ones who already go out of your way to support your child, encourage him, be there for her. And isn’t it fun when the game or the concert or the play is over, and you can talk about the highlights and laugh (maybe not in that moment, but later) over the miscues? Before we wrap up, let’s talk about what this post is not. It’s not a guilt trip. Goodness knows we’ve all been on enough of those. It’s not a “Look at me! Aren’t I the perfect mom because I attend all my kids’ activities? !” I’ve been blessed with parents who set the example in this area. I have a husband who works hard and manages money well so that I don’t have to work outside the home, which gives me the time to do all the things. I’ve been granted the health and strength to make this process work. Lastly, this isn’t a license to obsess over every move my kid makes, or to relive parts of my own childhood through my children’s accomplishments. It’s simply a reminder of the importance of building relationships. If you don’t have kids, apply this to your marriage or your friendships. Be present when you’re with that person. Practice enjoying what brings them pleasure. Celebrate their wins and grieve with them in their losses. But back to us moms…On those occasions when you wonder if it’s worth it to read one more book aloud or exclaim over one more Lego creation or take another long drive to watch that kid play (or sit on the bench) in a game, remember our goal. We’re building a relationship with that child that will last a lifetime. And the time to invest in that relationship is now. You can’t go back and do it all over again. And do you know what happened last Friday, the final day of my girls’ spring break? That 16-year-old and her sister, they got in the car and drove off on their own to meet friends at the ice skating rink while I stayed at home. And just like that, it’s my girls – not me – putting just a few more miles on that car. Here’s my latest version of “Kids Say the Funniest Things” – and it brought to mind such an important principle for our parenting! At the top of the page in her Awana book was a picture of a boy with a plate of food in front of him, and some words printed next to the picture describing what the verse was about. Once she had memorized the verse, I asked her to tell me what it meant. He obviously mistook the word “murmuring” for “murdering!” After I gently told him that his description was also incorrect, I explained that the verse meant to do everything without whining and complaining. Honestly, I think they had two thoughts – they both liked their interpretations of the verse better, and they also probably understood that they’re guilty of whining and complaining at times (aren’t we all!) What the verse really meant was more convicting than the meanings they had come up with. This experience reminded me of the importance of explaining God’s Word to our children. While memorizing Scripture is great, how much more valuable it is when our kids learn to apply those verses in their lives. Our daughters are at the age now where they sometimes hear views that differ from ours. Whether it’s from their friends, at their Christian school, through media, or in other arenas, they are slowly being exposed to a wide range of opinions about what’s right and wrong, how they should act, and what they should believe. Since they’re 16 and 14, my husband and I are able to actually have discussions with them about these topics. My burden lately is that every time a new question comes up, we will not just share our opinion, but that we will point them straight to the Bible, and share specific verses about why we believe what we believe. Because in the long run – and actually not long from now for our 16-year-old! – she will have to make her own judgments and decisions about what she will and won’t do, and I want her to decide based on God’s Word. It’s not enough for her to say “Well, that’s how I was brought up.” That will fail her at some point. Her convictions need to be based in the truth of God’s Word if she’s going to stand firm. Over Sunday lunch, a certain movie was the topic of conversation. While we had already decided that it wasn’t going to be viewed by our family, I wanted the girls to think it through, and come to a conclusion about why we should or shouldn’t watch it (even if this particular decision had already been made for them). 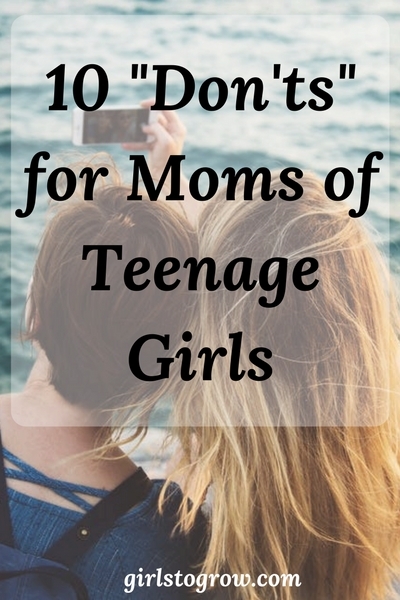 With teenagers, we are way beyond the point of “Do this/Don’t do this because I said so.” We are on the threshold of our daughters making all their choices on their own, so it’s vital that we point them to the Bible. Part of our training them is to help them learn to think critically and apply what they know from the Bible to every situation. No matter what age your kids are, get them thinking! Help them understand the Bible, not just regurgitate its facts or spout off verses that they don’t comprehend. If they’re saved, the Holy Spirit can take the Word of God, use it to convict them of wrong, and show them the right way to live. 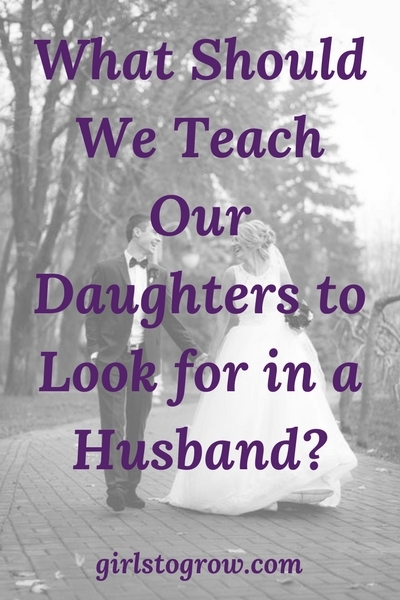 What Should We Teach Our Daughters to Look for in a Husband? If we’re going to talk about boy/girl relationships, I’ll tell you a bit of my history. I didn’t really date in high school. While I found plenty of boys that I liked and that I thought should be interested in me 😉 it was my freshman year of college before I actually started to date. The Christian college I attended had fairly strict rules, so most of my dates were on campus, and consisted of lots of talking, eating meals together, playing games and/or studying in common areas – or going to church services together, which was where my husband and I went on our first date! Since I now have a daughter in high school, we get to have some fun conversations about boys. I encourage both of our girls to get to know guys as friends while they’re in high school, to use these years to learn what types of personalities work well together, and to begin to understand what attributes might be important to them in a future husband. When it’s time to get serious about the type of guy they want to marry, there are a few qualities that are key. The neat thing is that this is not a theory I have to explain to our daughters or a lecture they have to sit and listen to me give. I get to point out these qualities in their dad – so he has a major role in helping define what the right guy is going to look like for them! Here’s a list of nine traits to help them get started as they consider the type of man they want to marry. 1. He’s a Christian. Our girls already know the Bible verse (2 Corinthians 6:14) about not being unequally yoked together with unbelievers, so this needs to be the determining factor before their heart and emotions get involved with a young man. 2. He walks with God. More than just having a salvation testimony, I hope our daughters seek a man who has an authentic relationship with Christ, and who demonstrates that through his words and actions. For example, since going to a local church to worship God and minister with others has been important to our girls, the man they’re getting to know should have the same interests. The rest of these traits should naturally flow from this one, but we’ll break them down anyway. 3. Character. He has a good moral reputation and is a man of integrity. This is one of the greatest things that my husband models for our girls. He is determined to always do what’s right in a situation to the best of his ability. 4. Kindness. It sounds like such a simple thing, but not every guy is going to be genuinely kind to others. 5. Hard worker. A guy’s work ethic is going to play a very important part in how life goes for their family. He doesn’t have to start out with a great job making lots of money, but he does need to be willing to work hard and to look for opportunities to improve himself. Watch out for laziness! 6. Sense of humor. Life is going to be serious enough; you need someone to laugh with as you go along! 7. Comfortable in his own skin. Not only do you want someone to laugh with, but you want a guy who can laugh at himself. He is who he is, and doesn’t “put on airs” to try to impress other people. A man like this will also be humble enough to ask for forgiveness when he’s done wrong. 9. Honest. A lifetime relationship of marriage requires trust. Don’t just consider how he interacts with you, but watch how he deals with other people. Is he always looking for a short cut to get things done rather than doing the job thoroughly? Is he totally up front about all the details when he’s conducting business? I remind my girls that they’re not perfect, and that there’s no perfect guy out there, either! You’re not likely going to find an 18-year-old who has matured in every one of these areas, but he can certainly have a heart that is bent toward God, and be pursuing a life that will glorify Him. God can give our daughters the wisdom and discernment they need as they begin to develop dating relationships in the coming years. And as for me? I can be on my knees praying! !